Regardless of the size and type of your business, buying general liability insurance is important to protect yourself and your company from any claim filed against you for either property damages or bodily injuries that third parties may suffer while in your business. Even though, business owners often confuse commercial general liability with other insurance policies designed to protect their employees from work accidents, as a myriad of lawsuits are filed every year against companies after hazards are suffered at the workplace. A commercial liability insurance policy basically protects your company’s assets paying for obligations such as medical expenses of someone that has suffered an injury while visiting your offices. As noted above, this type of insurance also protects property damages under similar situation, but does not cover workers compensation resulting from accident suffered inside the work place. 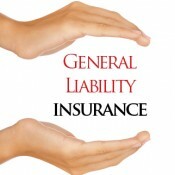 General liability insurance will not only pay the people involved in an injury or damage episode, but all your legal expenses resulting due to possible claims they might file including not only the cost of the compensatory damages, but also the expenses resulting from your responsiveness such as attorney fees. If your business has facilities to receive the visits of clients, or your employees have to visit clients, it is likely that you need general liability insurance as the risk of a possible loss, damage or payment of medical cost may happen. This type of insurance also protects your business when your workers have access to equipment that belongs to your clients, or when you have employees writing about a client or company that makes business with you, as an example, media companies that could sue your employee for their comments. In addition, general liability insurance will also protect your business when you, your clients or your employees are using third-party facilities to do business for your company and when having general liability insurance is a requisite to make business with some companies. How to Get General Liability Insurance Coverage Naturally, you can take out general liability insurance from one of the many insurance companies offering this service. Nonetheless, an insurance agent or insurance broker may help you to get an insurance policy tailored to your coverage needs in which a liability limit can be set. Most insurance companies will assign you a qualified agent to determine how much liability coverage you need, so do not worry about knowing too little on this matter because a reliable insurance company will not push you to buy more coverage than your really need. By answering a few questions about your business, a qualified insurance agent may determine the key points that are subject to coverage. In addition, they can also clarify any questions you have in mind, particularly separating general liability from workers compensation insurance, which is a separate policy that you must also take out, especially if you run a factory or a company with a work area that could be risky to your employees, even if it has the appropriate security measures to protect their physical integrity.